Israel’s far-right Minister of Defense, Avigdor Lieberman, has renewed his attack on the leader of the Joint List, MK Ayman Odeh (Hadash), accusing him of being part of a “fifth column.” On Monday, Lieberman opened Yisrael Beiteinu’s Knesset faction meeting by speaking about the demonstrations which were deadly repressed by Israel along the border of the Gaza Strip last week, as they have been since March 30. The defense minister continued: “Unfortunately, we also witnessed another phenomenon in which citizens of the State of Israel stand with Hamas against the country’s soldiers and against the security forces in Haifa. We can talk about freedom of expression, but it is not worth running away from reality. We’re talking about a fifth column,” Lieberman declared. Lieberman announced that he would ask the attorney general to launch a criminal investigation against Odeh, who allegedly cursed a police officer at the hospital where Jafar Farah, the director of the Mossawa Advocacy Center for Arab Citizens in Israel, was being treated for a broken knee incurred while under arrest following his participation in a protest held in Haifa last Friday, May 18. According to Haaretz’s lead editorial published on Tuesday, May 22, Leiberman — whose ongoing public career, in the paper’s words, is the real failure of law enforcement — and Minister of Internal Security Gilad Erdan — whose right-wing street cred has suffered as a result of what has been perceived as his inadequate support for Benjamin Netanyahu during police investigations of the prime minister — illustrate just how grave the situation has become in Israel, warned the liberal daily, as it marches with delusional confidence towards a Judeo-nationalist future. These cynical politicians know that, in today’s Israel, the easiest and surest way to drum up public support is through racist incitement, something which has no place in a democratic country, according to the editorial. 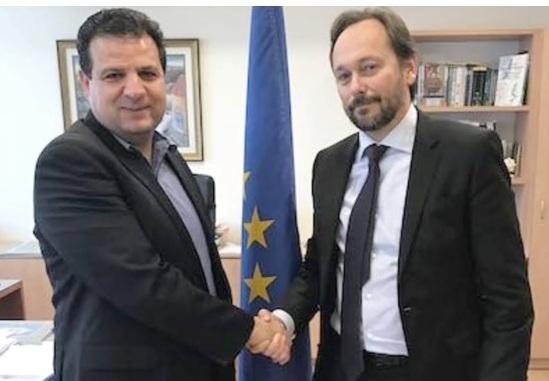 “The claims regarding the behavior of Odeh, who was prevented from visiting Farah, who was injured at the demonstration, fall into that category of racism and distortion of the truth. Given the brutal suppression by police of a demonstration by minority members, focusing on Odeh’s curses creates a false symmetry in the equation of violence. Odeh and the Arabs are the victims of the state, not the other way around. Any citizen who seeks to live in a democracy should be disturbed by the wanton, racist incitement by Israel’s leadership against the Arabs,” wrote Haaretz.